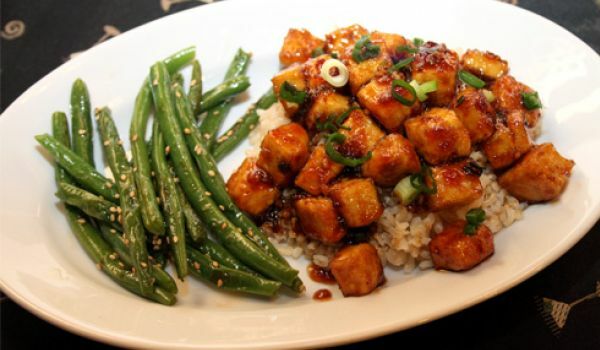 Mongolian Tofu is a yummy dinner dish, perfect for vegetarians. Learn how to make/prepare Mongolian Tofu by following this easy recipe. Mix 2 tbsp of soy sauce and 1 tbsp of sesame oil over tofu. Prepare the vegetables now by cutting the stems from bok choy leaves. Cut the stems into ½ inch pieces and cut the leaves in a similar way. Blend the mixture of 2 tbsp of soy sauce into Corn starch in small bowl until its smooth. Heat the pan over medium heat and add peanut oil to it. Add bell pepper and Bok Choy stems and garlic to it. Cook it for 5 minutes and add green onions and Bok Choy leaves to the mixture. Stir fry it for 2 more minutes. Now add the Tofu that was seasoned in the beginning into the soy sauce mixture. Stir fry for 40 seconds. Add sesame seed before serving.